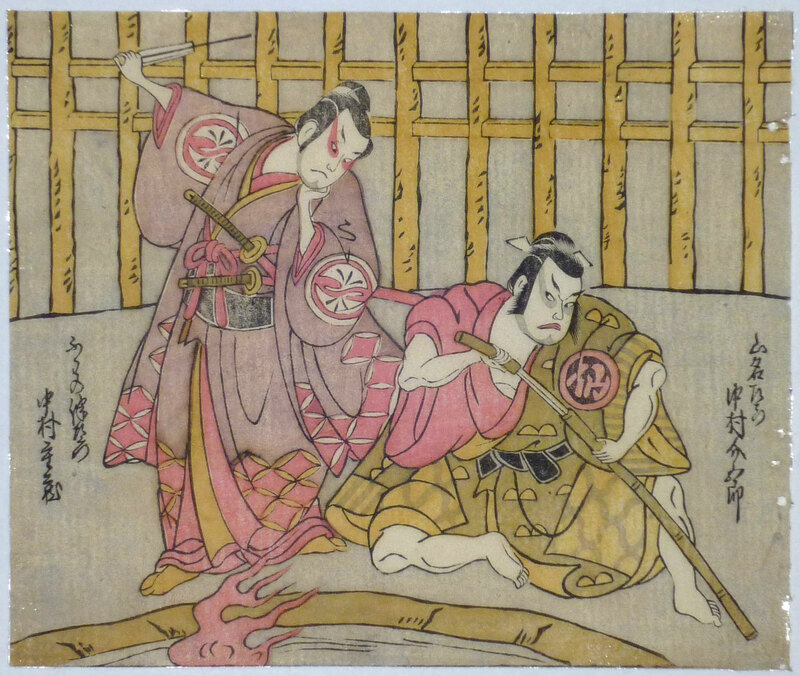 Little is known of the artist’s life except that he was a pupil of Kiyomitsu. 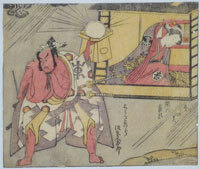 Shows the actor Bando Hikosaburo II as Watanabe no Tsuna and Nakamura Tomijuro as Ibaraki. This famous story recounts how Watanabe no Tsuna cuts off the arm of the demon Ibaraki at the Rashomon Gate, Kyoto in 976. He secretes the arm away in a box. Subsequently he is visited by his wet-nurse ( or aunt – depending on which version you read ) who convinces him to show it to her. Instantly she snatches the arm and flies off revealing herself to be Ibaraki in disguise. The story became the famous no play Ibaraki. Published by Bakuro-cho ichome, Yamashiro han, c. late 1760s. Fine impression. Pristine condition. The fugitive dyes perfectly retained. In the same condition as the day it was printed. Signed Torii Kiyotsune fude. 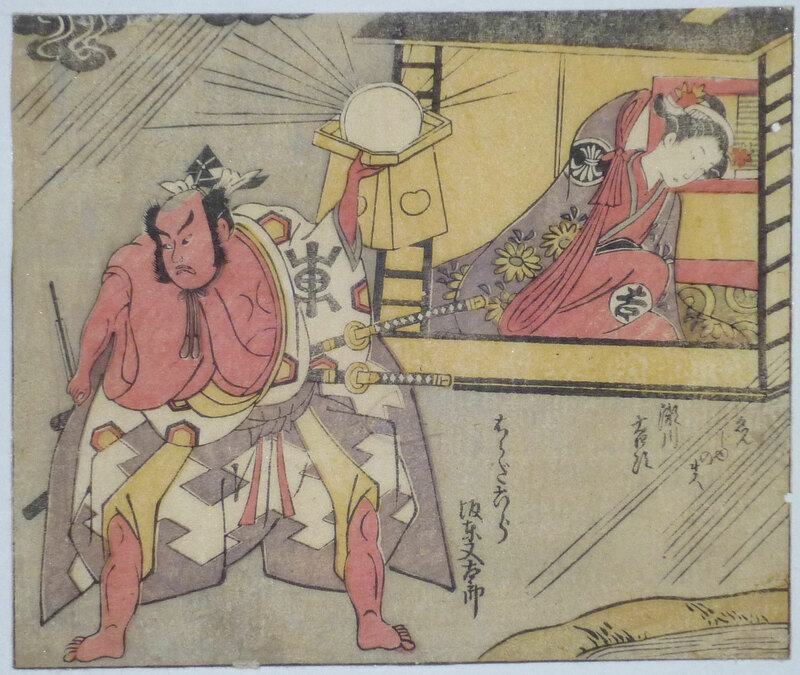 A quarter-block, 5 x 6 in; 12.5 x 15 cms print showing the actors Segawa Kichiji III ( right ) in an onnagata role ( unread ) and Bando Matataro IV as Harada Rokuro in the play Kono hana yotsugi no hachinoki performed at the Ichimura-za in the 11th month of 1771. Fine impression with perfect colour. Small binding holes, otherwise fine condition. 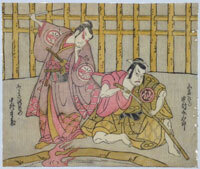 A quarter-block, 5 x 6 in; 12.5 x 15 cms print showing the actors Nakamura Sukegoro II ( right ) as Yamana Sozen and Nakamura Juzo II as Fuwa Banzaemon in the play Fukikaete tsuki mo Yoshiwara performed at the Moita-za in the 11th month of 1771.